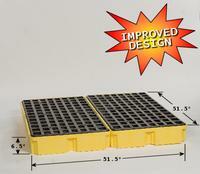 Add new flexibility to your spill protection. 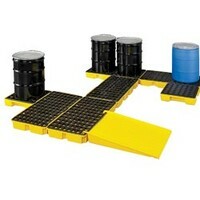 This unit works in conjunction with our 2 and 4 drum modular platforms (models E-1632 (Pic. 3) & E-1634 (Pic. 4)). 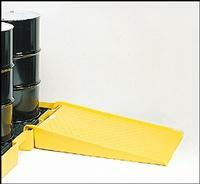 The 1-drum platform (Pic. 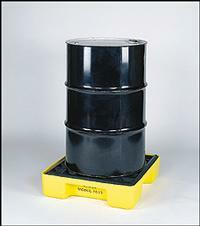 2) is constructed of durable high-density polyethylene to resist corrosion, easily removable grating for cleaning, and features a low profile for easy loading and unloading. Includes 1 U-channel connection strip. Compatible with the optional E-1689 (Pic. 5) ramp and ships via UPS.